I decided a few weeks ago to enter a blog contest. It is for the visitor’s bureau in my town and the goal is to highlight activities/venues of interest. There is a ton to do here – it is really quite overwhelming when I think about it sometimes – and I figured that most of the things I take people to when they visit would be highlighted in other’s entries. After some thought, it came to me: I wondered if there were any labyrinths in town. Now, at the outset, this is probably a strange idea to spring to mind. But I became interested in what is known as “walking the labyrinth” a few years ago when I read a magazine article about it. While most think of a maze with high shrubbery walls to get lost within as you choose which route to take, a labyrinth is very different. It generally has a single, non-branching path in to and out from the center. Some use it a spiritual tool for prayer or meditation, while others find it helpful for relaxation or refocusing. It was around Easter time a few years ago when I first heard about the practice and I was intrigued. I was struggling with some personal and professional stress and was really not looking forward to spending another holiday on my own. I decided that instead of focusing on my singleness and feeling lonely on Easter, I’d instead seek out some local labyrinths and spend time in prayer and reflection. I found three public labyrinths in the area and set off immediately after church. Honestly, I felt a little weird. Here I was, alone on a warm spring day, a holiday, no less, in search of something many had never heard of or even knew existed in our area. But it seemed fitting, in many ways, so I tried to put that awkward feeling aside. I remember the first I visited, on the grounds of a church. It wasn’t very big and I had to figure out where it began so I could begin my walk but as I walked through it, I started to feel my apprehension lifting. I began to feel calmer, more at peace, and less alone. The next was similar and I was enjoying my little adventure. The third and final location, however, was a bit harder to find. It was in a local park but I couldn’t make heads or tails of where it was. I walked a trail for a bit and finally found it in the middle of an overgrown field. It needed tending but the path was visible and so I set out. Others were walking the trails and could see me, this lone woman, apparently walking in circles in a field. Again, I felt the awkwardness overtaking me but as I concentrated on the path and focused on my steps, it lifted. I left feeling refreshed, though I couldn’t rightly pinpoint why or how. But I knew there was something to this – this stepping outside of oneself for a bit, of putting aside worries and concerns, of focusing on putting one foot in front of the other as the labyrinth took you step by step to the center. And so that is how it popped into my mind here. I quickly visited the Labyrinth Locator and found two public ones nearby and set off, camera in hand. Again, as I walked through them I had a similar feeling of peace and of centering; if you know me, you know that I don’t ascribe to what I often call the “crunchy granola” side of things but there is simply no other way for me to describe the experience. While I can’t say for sure if my blog entry will get posted, I hope it does. I think it’s important to look for the unusual in life, to find those local treasures in the day to day that are often overlooked. 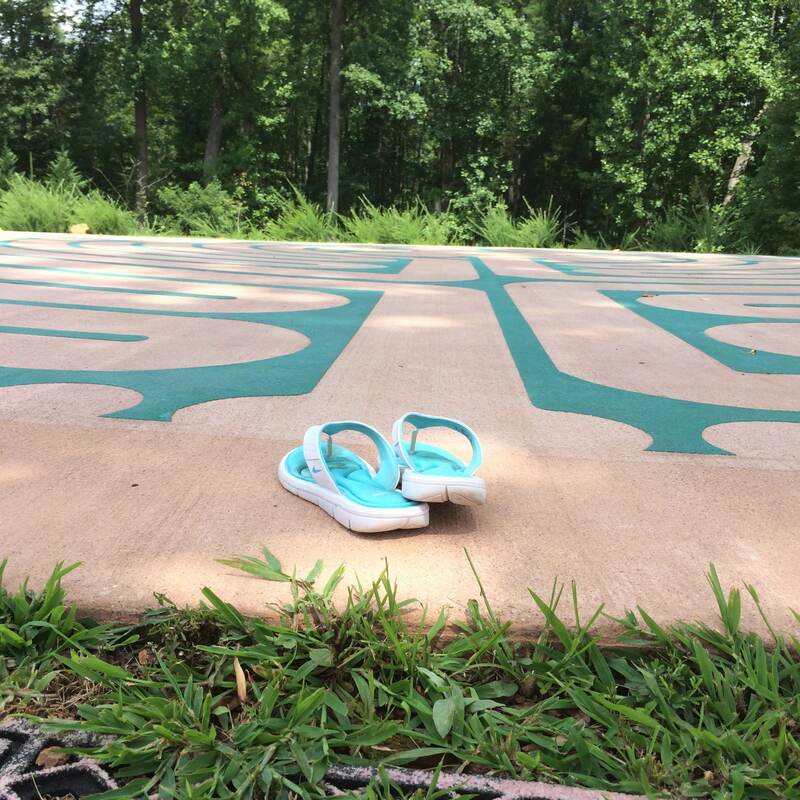 The entrance to the labyrinth at Unity of Charlottesville. It suggests removing your shoes, which I hadn’t done in the past, but there was something meaningful about the experience of walking the path barefoot to the center.